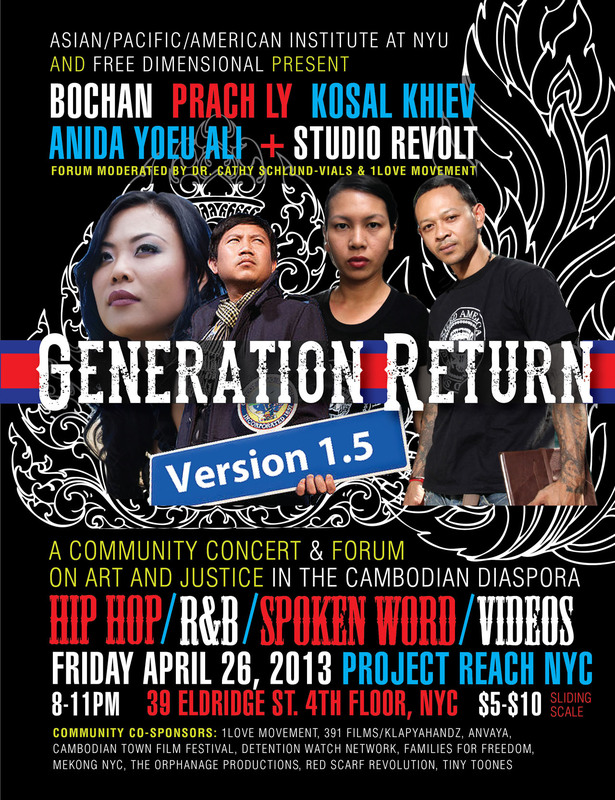 Generation Return: Version 1.5 is an evening of spoken word, hip-hop, and video screenings featuring urban voices from Phnom Penh to NYC. The line up includes performances by Bochan Huy, praCh Ly, Anida Yoeu Ali, Kosal Khiev, and video selections by Studio Revolt. This event highlights artistic practice as a means to address issues of collective legacy and contemporary justice. Featured Cambodian American artists are actively engaged in international dialogues and community activism through art. The event title is a reference to the “1.5 Generation”, individuals who either “came of age” under the Khmer Rouge or were born in refugee camps. As products of war and as intergenerational witnesses to genocide, 1.5-generation Cambodian American artists have been on the frontlines of capturing the traumatic past and pushing for international justice. Anida Yoeu Ali is an artist whose works span performance, installation, video, poetry, public encounters, and political agitation. She is a first generation Muslim Khmer woman born in Cambodia and raised in Chicago. After residing for over three decades outside of Cambodia, Ali returned to work in Phnom Penh as part of her 2011 U.S. Fulbright Fellowship. Her pioneering work with the critically acclaimed group “I Was Born With Two Tongues (1998-2003)” is archived with the Smithsonian Asian Pacific American Program. She is a collaborative partner with Studio Revolt, an independent artist run media lab in Phnom Penh, Cambodia where she currently resides. Bochan Huy has dedicated her life to spearheading and continuing to sow the seeds of the Neo-Cambodian musical breakout movement. By collaborating with adept pianist and producer, Arlen Hart, Bochan effortlessly bridges the East West gap with an inimitable, soulful yet sweet indie-pop vibe. She authentically draws on her dual country upbringing; combining influences from the ultra urban Oakland scene, coupled with her deep rooted Cambodian inspiration and fellowship, to create her infectious new sound. praCh Ly is an internationally renown, critically acclaim, award winning artist. His debut album is the first #1 rap album in Cambodia. Newsweek proclaim him as “the first Cambodian rap star”. Through masterful lyrics of powerful rap music, his music not only entertains but also educates. He lectures and headlines events in prestigious institutions and Ivy League universities, from the Smithsonian in DC, to the International ‘Freedom to Write’ festival at BROWN to the Scholars at Risk at HARVARD. Kosal Khiev is an exiled poet, tattoo artist, and survivor of the US prison system. Born in a Thai refugee camp, Kosal’s family fled to the U.S in 1981. Upon release in 2011, the U.S. government deported him to Cambodia, a country he had never been. Since his arrival, he has taken the urban arts scene by storm, using spoken word to uplift his situation with compelling performances at open mics, universities, and public stages. Kosal was selected as the poet to represent Cambodia at the 2012 London Cultural Olympiad. 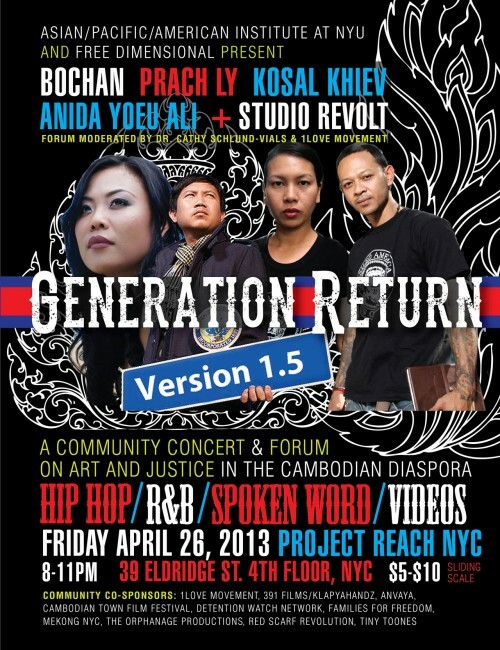 Kosal continues to collaborate as an artist-in-residence with Studio Revolt on projects such as “Verses in Exile” his upcoming webisode series and the documentary “Cambodian Son” about his first year living in exile in Cambodia. Dr. Cathy J. Schlund-Vials is Associate Professor in English and Asian American Studies at the University of Connecticut (Storrs). She is currently the Director for the UConn Asian American Studies Institute and is the author of two monographs: Modeling Citizenship: Jewish and Asian American Writing (Temple University Press, 2011) and War, Genocide, and Justice: Cambodian American Memory Work (forthcoming, University of Minnesota Press, 2012). She also has published work in Life Writing, Modern Language Studies, MELUS, positions, and American Literary History. Her research and teaching interests include Asian American literary studies, Southeast Asian American studies, cultural studies, refugee narratives, human rights, and immigrant literature. freeDimensional is an international network of art spaces and human rights organizations that provide critical support to culture workers who find themselves in situations of danger as a result of their creative practice. Since 2005, fD has come to the aid of over 150 activists – visual artists, journalists, musicians, performers, writers and community organizers – from more than 35 countries. Based on the belief that creative expression fuels social justice movements, freeDimensional works with the global arts community to identify and redistribute resources, and support meaningful relationships between art spaces and activists. Studio Revolt is an independent artist run media lab that produces films, videos, installations and performance projects in Phnom Penh, Cambodia. The media lab serves as a collaborative space for performance artist Anida Yoeu Ali and filmmaker Masahiro Sugano. Since their arrival in 2011, Studio Revolt has become a prominent presence in the contemporary arts scene of Phnom Penh showcasing their works in public screenings, exhibitions, and public art projects. 1Love Movement – Born out of a detention and deportation crisis in the Cambodian American community in Philadelphia in 2010, 1Love Movement now exists a national network of grassroots Asian American organizers that unite our communities through leadership development, policy advocacy and political education. We organize for power in our unjust deportation and prison systems, so our families can live together with dignity.